Today was a planned day off of work so we could get the last bookcase installed in my studio and install the finish trim. It took us about four and a half hours to get everything done today. I have some trim left to do in my office space but otherwise we are ready for painting. Because everything is going to be painted we were able to use a lot of scrap trim to finish up the job; holes and edges can be sanded, caulked and painted and look just fine. I really like the new angled bookcase we installed. It’s in my top five favorite things I’ve designed in my lifetime. It’s going to look great when it’s painted. The middle shelves are angled to get more storage capacity for larger books on the left side. At the right side it’s all the same depth so it doesn’t protrude into the floor space below. There is still room in my studio nook now to put a chair and ottoman for reading or relaxing (sleeping). We also trimmed out the tall bookcases with a wrap of 1×3’s at the ceiling and a band about 90″ up. This lower band is right at the height necessary for a library ladder, should we ever choose to install one down the road. Note to separate the wall color between his and her studio (above) we nailed up a small block of trim next to the window at the top of the tall bookcases (see photo). I’m not sure what colors I’ll select for my studio, other than I think the bookcases will be “cardboard” in color, with the wall likely being a tone lighter than that. The painter recommended oil paint for the bookshelves for durability but we don’t think we want to deal with the smell and the long term chance that the paint might yellow. Instead we’ll tell him to paint the shelves in latex (which isn’t as durable and never really “dries”) and then I’ll hit the horizontal surfaces with a water based clear coat to make them more durable, almost like plastic. Take a look at the photos and let me know what you think. The tall bookcases are all trimmed out and ready for painting. The angled design of the bookcase allows larger items to be stored to the left, smaller items to the right, while preserving usable floor space. The angled bookcase installed and ready for painting. The three peanuts we grew this year. I’m a softie what can I say. Or should I say my wife and I are softies. 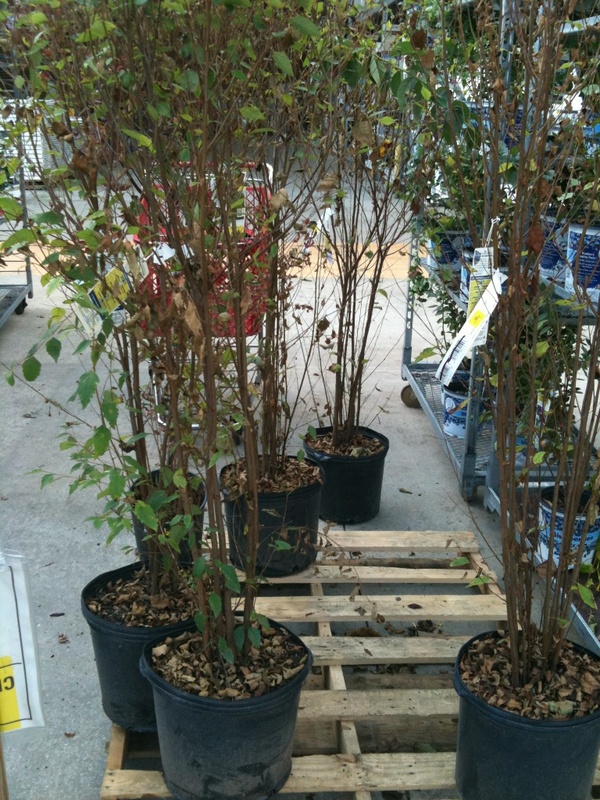 wife: Lowe’s has 5 river birch clumps and a japanese maple on clearance for $5. they need TLC. me: I’m fine with the birch. no maple. how big are they? wife: taller than me. not sure they’ll fit in car. me: ok we can pick up with trailer later. wife: ok, all paid for and set aside. wife: maple looks sad all alone now without his friends. me: i don’t like japanese maples. that’s what people who don’t know anything about landscaping put in their yards because their neighbors have one. they plant them right before they clean out their immaculate garages and go golfing. I don’t like japanese maples. So eventually she came home, I finished up my work and we ate dinner. We loaded our boys in the RAV4 and I hitched up the trailer. Off we were to Lowe’s. C’mon….do you honestly think I’m a complete monster? The little maple was so pathetic. Our birch trees were all loaded on a cart by the check out. Way, way, way in the back in the clearance section was a pathetic 4′ tall japanese maple tree, lying on its side, roots exposed to the world. How the hell am I supposed to walk all the way back there and just leave it there. They would have probably thrown it out after closing time. So I reluctantly peeled off six dollar bills and exchanged it for sixty-seven cents, a receipt and one japanese maple tree. This totally goes against my better judgement and everything I was ever taught by anyone who taught me anything in my nearly 40 years on this planet. The chances of any of these trees living is slim and none. So we watered “slim”, “none” and their four friends when we got home and we’ll plant them tomorrow morning. Why I feel compelled to try to save things that are basically dead already I have no idea. First it was the bee on my door last week, now this maple tree. And this coming from a guy who once had to shoot a deer a half-dozen times before it’d die. I wouldn’t wish being me on anyone. No way could someone handle my self-imposed lunacy. Heck, crazy people get weirded out when they’re around me….I make them uneasy. Please see to it that this ornamental tree finds the love and attention it deserves in your kind, caring, lacking (we noticed you’re the only house on the cul-de-sac without a japanese maple) landscape. Do not attempt to find us. It’s for the best that he think you are his one and only family. I’ll eye dropper some salt water tears on the page for effect. Back inside the house I went up to the wife’s secret beer stash in her studio fridge and grabbed two Buds. I thought about three but then my brother would be sending me AA pamphlet in the mail again. Upon reaching the foyer I had a choice: A) go lay on the couch, open one of the two Buds, and scuttle all hope for today…there’s always tomorrow right? Or B) put the door knobs on the cabinets in the Laundry Room. I sighed audibly three times to myself, put the beer in the Kitchen fridge, then walked into the studio and grabbed my drill. I like to put the knobs halfway on the vertical trim and line up with the inboard edge of the horizontal trim. From a practical standpoint though, this dimple mistake is good because it gives the wife a tangible source of resentment going forward, as opposed to some sort of underlying emotional neglect thing that costs hundreds, if not thousands, of therapy dollars to unearth during football season. After all the holes were drilled I used my trusty utility knife to break out the knobs and their mounting screws. It’s kinda weird, the little screws are in a bag inside the knob bag. Ugh, two bags to cut through. Well that doesn’t sound efficient to me (after all it’s nearly eight o’clock on a Friday…who’s going to drink that beer if I’m spending all night putting knobs on doors?). Well turns out it didn’t matter that I lost the screw. The lone drawer requires a longer screw that did not come with the knobs so “neener, neener, neener….I didn’t need that dumb screw anyway“. I found a longer screw from a previous job and it worked like a charm. The lost screw also adds thermal mass to the wall; Joe would be proud. We now have really nice looking chrome knobs on our Laundry Room cabinets. The knob monkey was not on my back for very long at all. He didn’t even have time to unpack. Knobs on cabinets. Also note the ceramic goose decorations are out, after sitting in a box for over a year. We’re finally moving in and making our house a home!!! That’s it. Nothing else really happened today. So we learned I’m somewhat inept, crazy and I have a soft spot for plants that really should just be thrown out. I guess there are worse traits in life. It’s Labor Day weekend peeps. Stay safe, have fun, enjoy life. Today was a little break in the action, we ran some errands including ordering our cabinets for the laundry room. The simple white thermo-foil cabinets we selected will keep cost down but still look nice organizing laundry room necessities, like cleaning supplies and household life debris, out of sight. Under the guise of organization I’ve been flipping out about the state of my art studio. It’s hardly a place to do inspired things like design work or art. Now it’s to the point where I can’t even move around. It’s fine if the rest of the family lives that way but I can no longer. So I took advantage of today’s self-imposed down time to work up a design for shelves in my studio. I want something that looks nice but they don’t have to be stained cabinetry quality. Rather I’m fine with tone on tone painted cabinets to match the walls and compliment the cement floor. My brother is a master carpenter and cabinet-maker so I’ve got the inside track on getting them made to my specifications. His insight and design sense will be indispensable as well; I can already see a few minor challenges in my design. I’ve got two full walls that I want to construct floor to ceiling built-in shelves. Right now all our art supplies are in a huge pile by the litter box. It’s a disaster trying to haul things in and out for art shows. Keeping “her” art separated from “his” art is random at best. And we’re not taking full advantage of our ten foot high vertical space that we have in the studio. It’s just awful really. Makes me not want to be in there – this is where I work every day. store our artwork / and art show supplies – for every show I have to load up the truck. Having everything organized and easy to access is the primary reason we built the house and the studio with double doors in the first place. Waiting years to get organized defeats the purpose. provide bookcases for magazines, supplies, books, knick knacks and momentos – I have a lot of garbage that has been sitting in boxes since we got married or at least since we moved last year, some of it will finally see the light of day again, including my car magazine collection (interesting note, the north wall of my studio will actually be further insulated by the thermal mass we’ll build against the wall by way of the bookcases and books. Something to think about in your house. Essentially the wall will go from 10″ thick to 22″ thick in places, buffering the north wind and snow. a small area for taking off shoes, coats and hanging up bee keeping suits – We use the studio entrance if we’re snowy or muddy, or if we’re checking the bees. We need a place to put on and take off clothes and hang up bee gear. an integrated drafting board – I do hand sketches and drawings for my design business. You saw the impromptu stand I made for our drafting board. I’ve got an idea that someday down the road I’d like to have my brother make me a heirloom quality, contemporary built in, one of a kind drafting board…maybe crafted from wood boards planed from cherry trees found on site. For now the old board will fit between the bookcases. shallow drawers for storing misc. studio tools and items. At 91″ from the floor a 3″ tall hardwood horizontal band to accept a future 8′ library ladder if deemed necessary. Here’s a rendering I created of my proposed studio design. You can see some of the key elements of the design. This would go a long way to getting my studio organized and working efficiently. The bench flips down because the double doors are only 10″ off that wall immediately to the right. So we’ll have to flip-up the bench to be able to open the doors all the way. The book-case on the right is 10″ deep, the one on the left is 12″ deep. We were honored to host another Kent State architecture class out at the house for a tour over the weekend. It was a chance for the students to see the sustainable and energy saving tactics in use in the house. Plus it was a great excuse for us to pick up around the place and run a vacuum so win win. We spent an hour or two walking through the house talking about windows, passive solar, geothermal, rain water collection and other neat green building topics. The students are working on a Habitat for Humanity project so hopefully some of the things we talked about can be used in their projects. I see no viable reason why not, as most of the tactics and systems cost no more to design and build, and as we’re seeing they can save homeowners money. If you’re not familiar, Habitat for Humanity helps build homes for low income families around the world. The homes they build are built to be environmentally sustainable, healthy and energy efficient whenever possible. Take a look at their website and volunteer or donate if you can; it’s a worthwhile cause. Later Saturday we had our friends over to talk bees. They’ve been raising bees for three years now so they were our go to source for the ins and outs of starting our hive(s) this Spring. We walked the land looking around for an appropriate spot for the hives. We all agreed on a spot that would get good morning sun (to help wake up the bees via the sun’s warmth), have a good wind break (from our prevailing southwest winds) and be easily accessible from the house. Retiring indoors, out of the cold, we boiled up some pasta and opened some wine. There’s a lot to know and I’m not sure how much sunk in but it was a good chance to figure out what order steps need to be taken in to get started. Next weekend will be bee prep day. We’ll drive out to the bee supply store and get our hive components. We’ll also put in our order for our bees. The little gals (and guys) should be ready sometime in April I believe. Next week I’ll clear an area in one of our meadows for the hive(s), lay down some gravel and cinder blocks. Upon the blocks the hive(s) will rest. I’m not sure if we’re doing one or two hives yet. I forget what we decided. Elsewhere we ran out yesterday and replaced my old computer with a new one. Being jobless, I’ll need a good computer to work freelance or consult so now was as good of time as any. The old one made working with photographs or illustrations impossibly slow. If I’m being paid by the hour then I need to work as quickly as possible. It was kind of depressing having to get the new computer, as I’d rather be employed but it’s really not my choice. I snagged the cheapest Apple iMac they offer; it’s also the smallest as to best fit in my home office desk. I used an iMac at the old job and really like the Mac for working on Illustrator, Photoshop and Form Z (CAD). A laptop would’ve been cool because then I could work anywhere, Ohio, Florida, wherever, but seeing as if I don’t even have any freelance work lined up I don’t have to worry about that. Plus the laptop is really expensive. Eventually as business takes off we can get a little more mobile. Or if we have to sell the house and buy an RV to park in Walmart parking lots then we’ll go the laptop route. Reluctantly I unpacked the new computer; Apple packaging experience as orgasmic as ever, but notably less so under the circumstances. The computer is amazingly light and thin. I placed its cool aluminum frame on the concrete patterned laminate desk top. Without taking its thin protective foam cover off I slid it back across the desk. Wouldn’t you know it: the all in one computer was too tall! It only fit under the wall cabinets if I angled the flat glass screen ridiculously skyward, or uneasily downward. I sat there dumb founded. I know I had looked at the dimensions of the computer online, even the new iMac that just came out (which I had purchased). Hmmm…. I weighed all my options and ultimately decided the only course of action was to raise the wall cabinets. I employed the help of my wife as I had no intention of taking the cabinets apart. Rather we’d raise the cabinets upwards, about an inch, all in one piece. I measured and there should be 18″ between the counter top and wall cabinets. I had mounted my erroneously 3/16″ to low, which is all it took. Apple designed their computer to fit under 18 inches but they did so way to closely in my opinion. Suffice to say I messed up and needed to rectify the situation. It only took us about 15-20 minutes so no big deal, but as with everything in (my) life, nothing is easy. I decided to set the wall cabinets at 19″ to give myself plenty of room for the computer but also not look out of place with the other cabinets in the room. I cut two boards at 19″ to use as supports. With the help of the wife we unscrewed fasteners holding the cabinets to the wall studs. I clamped the lower two letter box cabinets together for additional support as they are just attached by their front edge below the upper cabinets. With all the screws out we quickly slipped the support boards under the cabinets. We then drilled new holes into the studs and secured all the screws in place. Pretty easy and the computer fit like a charm. The new computer has just one cord so I don’t need the huge power strip that I had hanging there before. I ordered a pretty cool looking dual outlet surge protector. I’ll show it to you when it comes in. With the power strip gone, and the fact that the new all in one computer doesn’t have a huge tower taking up space, my desk is downright spacious now. I’m really happy in that regard, lot of space to work. Only other news is I bought the wife her first LED light bulb. She wants to take art photos in her studio and needed a little ‘daylight’ color bulb so for $14 I splurged and got her a 40W equivalent LED bulb. Uses about 90 cents a year in energy but she won’t use it that much, should last fifty years for the number of times she’ll turn it on. Ok, it’s Sunday…the Oscars are wrapping up (thank god; dismal as ever) and I should be in bed. This week will be mostly continuing on the job hunt (which I’ve been neglecting a little in the past week…mentally I’m shot, but a good weekend helps recharge that a bit). I’ve got art to work on, art shows to apply to, finish setting up computers, beat the pavement for a new gig, and get ready for bee season. One thing I’ll say, and it’s related to absolutely nothing, the place is feeling more like home. We’ve been here almost a year. I like the dining room table set up. Tonight I was fine just sitting at the table, watching our shows and drinking wine. No need to go and sit on the couch. Having just one dining table makes it more special as opposed to a dining room table and a dinette table. So I’m getting used to a few spots in the house; my dining table seat, my seat on the end of the couch, my studio. The boys seem to be settled in too. In less than 24 hours since all our guests left, the place is trashed all over again with toys, sweepers and food debris. Like a frat house on Sunday morning without the passed out co-eds (much to my dissapointment). Well enough of my nonsense. If I don’t talk to ya, have a good week, be nice and count your blessings. Getting home I knew I had several things to work on in preparation for Christmas, but my cabinet project looms over me like a monkey on my back. I kind of want to get it done so I can get back to working on arts and crafts. Plus installing these cabinets will free up garage space and I can get the Jeep out of the cold and rain where it sits slowly rusting away. Today I was able to install the three base cabinets in the auxiliary office area of my studio. It took me a leisurely hour and a half. Of course this is where learned if I did a good job framing the new walls, because I would be able to tell if things were out of square or not plumb as soon as I put in the base cabinets. Turns out I did about a “C” job for my first go at framing AND drywalling. For whatever reason my floor (I made myself) under the cabinets was out of level so I had to shim like crazy. This is opposed to the floor in the studio above where I installed cabinets previously…I didn’t have to shim anything from what I remember. Oh well. Also my wall was a little out of plumb and the corners aren’t the most square. Once the first cabinet was leveled I added yet another block behind the wall to provide a secure mounting point for the base cabinet. In hind sight I should have shifted my studs so that there would be one behind each cabinet. Oh well. Adding blocks was easy because the back of the wall is still exposed…. (eventually I’ll build a bookcase so I left off the drywall…that’s why I still have access). With the block added I drilled and screwed the cabinet in place using some #10 2-1/2″ black oxide cabinet screws; following the Shenandoah Cabinet installation guide. I then laid down more shims so the middle 12″ drawer cabinet would be at the same height as the first cabinet, and it would be level. Once in place I flushed up the face frames and clamped them together; the face frames of the two cabinets. I then drilled some countersunk pilot holes and fastened the face frames together, all flush and even. Next I added another mounting block and fastened the cabinet to the wall, screwing through the upper back hardwood mounting rail. Upon inserting the final cabinet I realized I forgot to center the cabinets on the wall. No big deal but the gap on the left side was a little bigger than the right…so I quickly disconnected and centered the cabinets…no big deal. I laid some shims down and inserted the last 18″ cabinet. Everything checked out level and looked good so I fastened the face frames and mounted the unit to the wall, including one “no-no” screw running through the side of the cabinet into the wall (“no-no” cause there is no hardwood mounting rail on the sides of the cabinets). It’ll be fine…cabinet’s not going anywhere. I trimmed out the gaps on either side of the cabinet assembly with some 1/2″ trim that came with the cabinet order. I glued and pinned in place the toe kick too. Finally I hoisted the premade laminate countertop up to see how bad it fit. I had the counter made under the premise I’d frame the area to fit the countertop at exactly forty eight inches wide. Well I messed up a measurement and ended up with about 48-1/2″ wide. Plus the corners aren’t square. Long story short I either need to live with it or get that countertop remade at about $100. We’ll see. The wife says it looks fine. I’m not worried either way. Probably back to art tomorrow but then at some point I’ll install the sink base and last wall cabinet. placing the shims, either individually or sharing between cabinets. yet another mounting block added. screwing cabinets to the wall. A countersink bit is handy to get flush screw heads. My crappy carpentry leads to big gaps at ends of custom premade countertop. I made good progress on the cabinet project in office area of my art studio. I put 2-3 more coats of drywall mud over the corners, screw heads and tape joints. I sanded in between coats. The mud I used was a premixed, low dust, type and it worked wonderfully. All the sanding dust fell right to the floor making vacuuming it up an easy clean up task. Look, I’ll never be a drywaller but the job turned out nice enough. I don’t really have the patience to do a perfect job, plus I’m overly detailed so I tend to over work things, especially when it comes to wet drywall mud. Long story short I lack the skill and desire to be a dry wall guy beyond the random wall here and there. The areas where the cabinets were going I didn’t finish up completely just because the cabinets would hide any flaws. This made the work a little easier. So once the mud was dry and sanded to the best of my ability, I applied a layer of Kilz primer to seal the raw drywall. A quart covered my “T” shaped wall assembly…about 8′ tall and ten linear feet. I just load a bunch of mud on the palette knife, spread it like peanut butter and then smooth it out. patchy mud drying on wall. I laid down some primer to seal the drywall. Nothing pretty, just get paint on the wall for now. Once the walls were prepared, I turned my attention to the floor where the base cabinets are going. I screwed in some 3/4″ thick furring strips to bring the floor up to level with the hardwood in the office area. In front of the cabinets I have about 5″ of floor space that needs some sort of flooring. I don’t have any wood floor left over from the build so I have to come up with plan “B”. We have a few options. I could reach out to the place I bought the flooring from and see if they have any scrap laying around. Our wood floors are a light maple so pretty much anything would do in the light maple family. I don’t think anyone would notice. I would just lay down two boards perpendicular to the existing hardwood floor boards. Another option is taking a piece of the dark walnut colored laminate flooring from the wife’s studio. Each piece of flooring is about 5″ wide I think so this could work. I have a half dozen left over pieces so I could fabricate something that would work. Lastly, I have some of the bronze porcelain tile left over (I think) from the build. I could inset some pieces of that to fill the void. Right now I think the last option is what we’re leaning towards doing. We’ll see. First things first though, I had to even up the now exposed edge of the existing hardwood flooring. I used a circular saw and plunge cut most of the boards, after scribing a line perpendicular to the wall. For the remainder pieces that the circular saw couldn’t reach I used my trusty oscillating tool. I used a circular saw set to a little over 3/4″ to create a straight edge where the flooring ends. Oscillating tool comes in handy to finish up cutting the floor boards. Once the floor was prepped, I jumped onto mounting the cabinets. I set a level line across the wall to denote the bottom of my wall cabinets. My base cabinets and counter top out at around 30.5″. I then added another 17.625″ to represent the space between the bottom of the wall cabinets, and the countertop. So about 48″ up is where my line went. This matches what I did in the adjacent desk area of the office. Under that line I mounted a wood strip to provide support to the cabinets while I install them. A wood strip (and a friend) comes in handy to support the cabinets during installation. Also since I still had access to the back side of the wall I added some more wood blocks so I’d have something to screw my 12″ wide cabinets to when mounting them. Normally this isn’t an option with small cabinets, they usually fall between studs, but since I could, I did. I added a 2×4 up high and about 36″ down from the top so I could fasten the 12″ cabinets securely. Once that was done I preassembled the three wall cabinets on the floor. I also mounted a row of spice drawers under the center 24″ cabinet. With everything clamped together I predrilled all the holes…..holes in the frame rails to attach the cabinets side by side, and holes in the mounting rails in the back of the cabinet to mount them to the wall studs. By the way, I simply measured the stud locations and transferred marks to the back of the cabinet, and drilled pilot holes….about 1/8″ holes. A flexible shaft for the drill came in handy as it’s difficult to drill holes in the face frame of small 12″ wide cabinets. The center cabinet is open (no doors) so I wanted the exposed mounting screws on the 12″ cabinets so they’d be hidden behind closed doors. Flex shaft for the drill is a great tool for the job. I then disassembled the cabinets and hoisted the center cabinet assembly up onto my support strip. With someone else holding the cabinet in place I drilled pilot holes into the studs, through the pilot holes I drilled previously in the mounting rails of the cabinet. Before the screws were all the way in, I checked to see if the cabinets were level. I leveled them up with some shims…actually removing the mounting screws so I could then repass them through the shims. Anyway, after much fussing the cabinet was mounted. I then repeated the procedure for the two 12″ cabinets. The one twelve incher I was able to secure sideways too as a bonus, passing a screw through the cabinet into a block I put in the wall a while back. Once all the cabinets were installed I mounted the knobs on the spice drawers and re-installed the doors on the 12″ cabinets (I’d removed them for installation). Next I’ll install the base cabinets as well as the sink area cabinets. Open center cabinet for knick knacks or whatnot. Spice drawers for charging cords and whatnot. Real quick update, I demo’d the little half wall in the office area. As simple as that. Was nice that the guys used screws to assemble it so I was able to pry off the drywall and then unscrew everything will little mess. I first cut the drywall with a jab saw, cutting up from the drain pipe hole, all the way up to the cap trim. here I’ve carefully pried half the drywall off. I’ll remove this last drywall piece and to create a crawl space to fix the HVAC vent, and for future access in case pipes or wires need to be fixed or run. Yay! I’ve removed the half wall. I can start laying out where the new walls will go and extend the platform to support the cabinets. This floor vent is hidden under my office floor, they never cut a hole in the floor for it. I plan on going in and rescuing it as part of this project.